Established in 2005, Gallo Moving & Storage is a full-service moving and storage company headquartered in Milford, Massachusetts, and an office in Braintree, MA. As an agent for United Van Lines, they are held to a higher standard. They provide professionally trained drivers, helpers, and packers who have been through some of the most rigorous training in the industry. Also offering “white glove” moving services including cleaning services, professional organizers, and moving tools, Through their affiliation with United Van Lines, they have the network and expertise to pack, move, and store items across the state or around the world. Gallo Moving & Storage has won numerous awards and is routinely recognized for its commitment to quality and integrity. The site design included the first four Home page slider images. 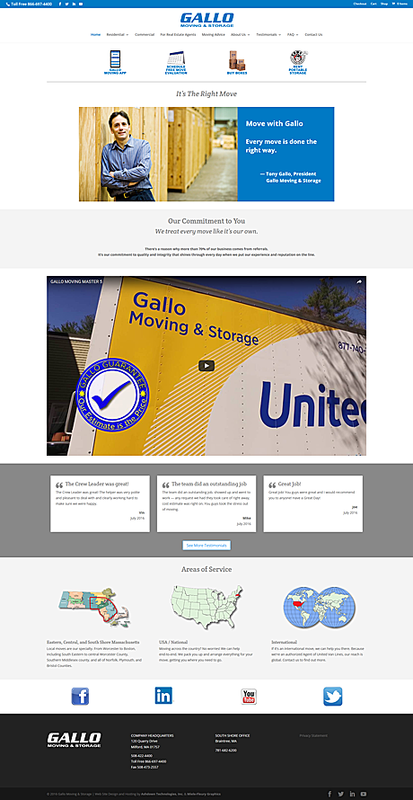 Visit the Gallo Moving & Storage web site.